After this previous tournament, I conducted a tournament between various versions of the top engines under the same settings with more games. The results are shown below. Congrats to the stockfish team for winning this tournament! I computed the perft number for 8x8 checkers for depth 24 with the same distributed implementation I used earlier for depths up to 23. Below you see the perft breakdown per move (called "divide") from the initial position for depths 22, 23, and 24. I conducted a full tournament between 17 currently available UCI engines for Android as well as the simple built-in Java engine. The tournament consisted of pair-wise matches between all engines for 10 games with random book opening play, one second-per-move, 32MB hash, and 8MB tablebases cache with the 3- and 4-piece Nalimov, Gaviota, Scorpio, Robbobases endgames on SD card. The 1530 games lasted about two days running full time on a Nexus One phone (without a single crash!). The results are shown below. A test tournament between different versions of Miguel Ballicora's Gaviota and Michel Van den Bergh's GNU chess. And another test tournament between different versions of Jan Brouwer's Rotor and Ben-Hur Carlos Vieira Langoni Jr.'s RedQueen. Another test tournament between different Android Stockfish versions and compilations (from Jim Ablett and myself). I am generalizing the engine match feature in Chess for Android into an engine tournament feature, where several engines can be invited at once, after which the GUI plays matches between all engine pairs. To test this new feature, I ran a tournament between a few of the Android UCI engines recently released on Jim Ablett's Chess Projects Website, as well as the built-in Java engine (using the fast-move setting, 32MB hash, and Nalimov, Gaviota, Scorpio, Robbobases endgame tablebases on SD card). Below the results are given in cross-table format. 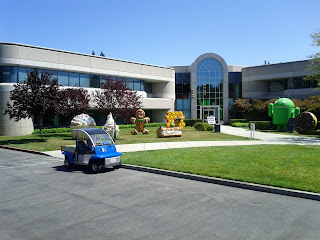 Google celebrates each new Android release with another statue on our campus. Below some pictures I took today. Can you spot cupcake, donut, eclair, froyo, gingerbread, and honeycomb (and a Nexus One)? Don Dailey and Larry Kaufman released their chess engine Komodo 1.3 for Android, kindly compiled by Jim Ablett and made available at his excellent Jim Ablett's Chess Projects Website (where you can find many more engines). Below you see some screenshots importing the UCI engine into Chess for Android. The engine is strong. The following cross-table shows the results of a few one-second-per-move matches with other engines on a Nexus S (1GHz Hummingbird) with 32MB hash and Nalimov/Gaviota/Scorpio/Robbobases endgame tablebases on SD card.